Henry Cloud said “We change our behavior when the pain of staying the same becomes greater than the pain of changing.” I repeat this quote to myself daily, sometimes several times a day as I remember why I am making the changes. In my previous post I talked about pain – enduring small pain now to avoid greater pain in the future. This often involves change. My change happened when the pain of staying the same was much more than the pain of changing. We were in over our heads. We had credit card debt, student loan debt, car loan debt, a mortgage, and just couldn’t pay everyone what they demanded. Our grocery budget was tight, there was no money left to spare. I will always remember the day: I had just done a load of laundry and was hanging my bath towel back in the bathroom after being washed. I looked at the towel. It was once a white towel. Now it was off-colored and stained and the edges were worn. And I could not afford to go and buy myself a new towel! I had two little girls to feed and started to panic. I couldn’t even buy myself a new bath towel. We were one paycheck away from disaster if a lay off happened, or a disability, or even a repair as minor as a broken dishwasher or flat tire on the car. I vowed then and there to change! I wanted to be in a better situation for myself, but even more so, for my children. This is when the pain of staying the same overwhelmed me and I longed for change. I don’t believe change will happen until we become “sick and tired of being sick and tired” (phrase borrowed from financial guru, Dave Ramsey). It has to be an intrinsic desire for change. No one can make us change. Not real, lasting, life-altering change. This has to come from the inside, from a purpose and a reason and a drive to make the change(s). We’ve all heard the quote “If you always do what you’ve always done, you’ll always get what you’ve always got.” (attributed to a few different people). I knew that if we kept doing what we were doing, we weren’t going to get where we wanted to be. That was the day I decided to change. Dissatisfaction with your present situation. Strengthen your vision of your future situation. Build a plan to get from the present to the future. Lower the perceived cost of the plan. In the next few posts we will talk about number 1 – Dissatisfaction with your present situation. We will learn about the time value of money, compound interest, what your debt is really costing you, as well as what the cost of delaying savings is. Think about your financial situation. Are you happy with where you are? Do you have a plan to improve your situation? Do you know what your situation is? (if not, read my post about calculating your net worth first). How would you like your financial situation to be? What do you want to change? What are your beliefs about your ability to change? A little pain now, or a lot later? It was time for my baby’s six month check up appointment and routine vaccinations. Two of my older girls got to come along to the appointment as well. When it was time for shots, my older girls became concerned and asked me why the baby had to get shots. They love their baby sister and get upset if she ever cries or is in pain. They didn’t want her to get hurt by the shots. I explained to them that the vaccines will help prevent some very serious diseases that can be very painful, and very scary and life threatening. A little bit of pain now to prevent a lot of pain later. This made me think about personal finance. We need to be willing to go through a little bit of pain now, to avoid big pain later. For example, living on a tighter budget, avoiding debt, driving the old car another year or two, doing a staycation instead of going to Hawaii, resisting the urge to pull that credit card out or apply for that loan, or spending the money that is supposed to go to savings. These choices we make now will prevent a future of more painful consequences like being overextended, house poor, foreclosure or even bankruptcy, or having no buffer or emergency fund or savings when an emergency occurs. By being a bit uncomfortable now, we will reap the rewards in the future. That may be the distant future, or maybe a future that isn’t so far. Being able to learn self-discipline, when it comes to personal finance, is a valuable skill to learn early in life. I like to give my kids an allowance, to allow them to make money choices when they are young, when the consequences are small. Then, when the big choices come, and the big temptations are available, hopefully they can remember lessons learned in their past, and make better decisions. One example of this scenario is student loans. Student loans are very easy to get, very easy to justify (it’s for education and education is a good thing! ), quickly add up and then become difficult to pay off. What took a few months or short years to acquire can take a lifetime to pay off. However, choosing the smaller discomfort now of working while attending school, applying for grants and scholarships, attending a less expensive school or community college, will help you avoid the much greater discomfort later of paying back those large student loans, laden with interest! Naturally, we move away from things that are uncomfortable and gravitate to things that seem desirable. No doubt that is one of the reasons why credit cards have become so popular. It is uncomfortable to say no to something that we really want. It is pleasurable to indulge right now and not have to wait for the things you think you want. However, avoiding the small prick of pain now (waiting until you have the money to pay for the purchase), can set you up for much greater future pain (large credit card balance and payments, and enormous amounts of interest, for example). As I tried to explain to my kids, the shots do hurt right now, but that they will spare their baby sister much more pain later, they began to understand. And, because I love her, I will allow her to go through this small pain now, to be sure that her future is much less painful. I realized that I need to love my future self enough to endure some small ‘pain’ now which will help me avoid much greater pain in the future. It’s better to want than to owe! Indeed! I have been on both sides of the want or owe coin. It really is better to want than to owe. Wanting is much less painful than owing! Take a look at your financial habits. Is there anything you are doing now that is helping you avoid ‘pain’ or discomfort now, but that will cause future discomfort? What can you do to change these habits? Pick ONE to work on. Decide how you can change the behavior now to have a better outcome in the future. (For example, pack a lunch to work one extra day a week, and put the money you would have spent on lunch into a savings account, or towards a debt, instead). Don’t you love taking kids to the grocery store with you? Or any store, for that matter? my family will go without needed grocery items just because don’t have the energy or desire to drag kids through the store and tell them no to the Oreos and the cookies and the Trix Yogurt, etc., etc. But, as I was thinking about them and their endless desires for treats and toys, I realized that they didn’t understand why I had to tell them no so often, and why we can’t just buy everything we see and desire. So, during family council one Sunday I pulled out the Monopoly money, and counted out a pile of ‘cash’ to show the kids how much money daddy gets paid every month. Their eyes grew wide and they exclaimed that that is SO much money and that we are rich (anything more than $50 = great wealth!). Then, we talked about our monthly expenses. My intent was to show them that we have a limited amount of income, and that it needs to be spent wisely so that we can pay for our obligations, be able to buy food and necessities, and have a little fun, too. A side benefit of doing this exercise was that they learned a bit about our resources. They had no idea we had to pay for the electricity or water that we use. They had no idea that groceries cost so much. They had never heard of car insurance, and didn’t know much about health insurance. We also got to have a simple, but effective, discussion about debt. About what it is, what it does, why we don’t want it and how we are trying to get rid of it. This also led to a brief chat about taking care of our stuff, and also about how we are so blessed to have so much, when others have so little. They also began to see how quickly ‘all of that money’ was used, and what little was left over. This helped me explain why daddy had to go to work everyday and how thankful we are for him and his hard work and willingness to do it for us. This also helped them understand why mommy does her ‘typing work’ (transcription) to help us earn a little extra to help the debt be paid off more quickly. I didn’t realize how valuable this little lesson would be and the things we would learn together. I also didn’t understand how much they didn’t understand. I realized that they didn’t understand why I chose to tell them no so often, and why I would get frustrated with all the asking. Visually showing them the cash inflows and outflows has helped them gain an understanding and helped me gain new patience and willingness to do more teaching instead of reprimanding. This simple exercise helped my kids see how we can work together to support each other (taking care of the things we have, not whining when Mommy or Daddy says no, telling Daddy thank you for working so hard for us, being grateful for all of our blessings….). Maybe it will work at your house, too! 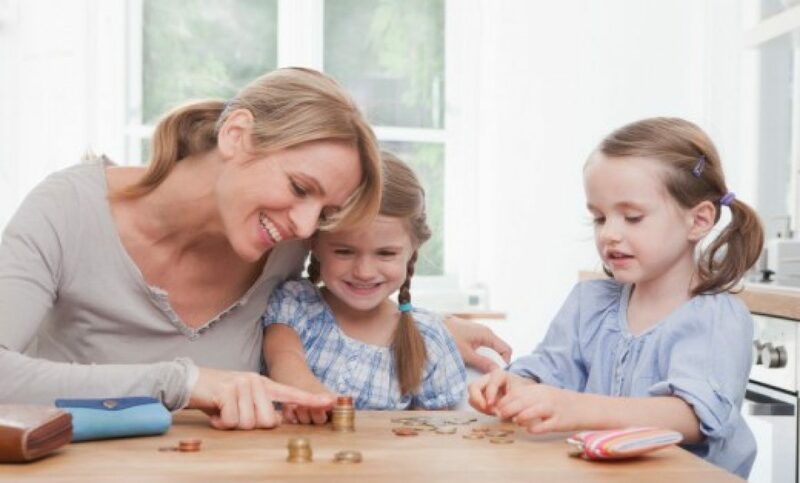 Sit down with your kids and discuss your budget. Do it in a positive and educational way. Share your financial goals. Maybe pull out the Monopoly money and show them the budget works. Help them to see how they can contribute to the ‘family economy’ by showing gratitude, serving each other, being patient, etc. Then, share in the comments how the discussion went! I love to read. My dream vacation would be somewhere warm and quiet where I could read all day long and drink Root Beer. The books I love to read are mostly self-help, personal enrichment and personal finance books. Some are fantastic. Some are duds and a total waste of time. And some of them fall somewhere in the middle. I hope, by sharing book reviews, you will be able to read books that are uplifting, informative, inspirational, and aligned with gospel teachings. So you won’t have to waste your time reading the ‘not-so-great’ ones. Each chapter focuses on a theme, and each chapter concludes with action steps you can take to implement the ideas you just learned throughout that chapter. It is book written from a Christian perspective, and Alli incorporates faith and giving your life to God, throughout each chapter. It is an excellent book to help you reevaluate your busyness, learn easy skills to simplify, prioritize, remember your true worth and discover your purpose. The book is 209 pages with 10 chapters and an Epilogue and is an easy read. Alli writes in a friendly and humorous way, and it is a delightful and inspiring read. I highly recommend. I highly recommend this book to any woman who feels life is busy and getting out of control. Alli includes God in all of her decisions and inspires the reader to step back and remember what is really important. Are there any personal finance books or self-improvement books you would like me to review? Let me know in the comments! Leverage debt, use debt, debt is bad, debt is good, debt is a tool, etc., etc. Some financial gurus tell us “Don’t borrow, debt is bad.” Others tell us to leverage our debt. Some say to pay off our homes. Other say it makes better financial sense to keep the mortgage and use the extra ‘pay-off’ money for investing. But what do the scriptures say about borrowing? But, what has the Lord told us about debt? Many of us are familiar with the scripture in Proverbs 22:7 “The rich ruleth over the poor, and the borrower is servant to the lender.” The first time I heard that scripture it struck me hard, and struck me as truth! Indeed, the one that owes is servant to the lender. While debt was necessary to print the Book of Mormon, the Lord had provided a way for the debt to be repaid. I know that if we are committed to ridding our lives of debt, the Lord will help us in these efforts! I will never forget a statement a friend made to me years ago. She said “Borrowing money is like telling my Heavenly Father that I am not grateful for what he has already given me.” How this spoke right to my heart! This statement became my new ‘mantra’ for getting out of debt and not incurring more, at least not without prayerful consideration. Each morning when I wake up I am grateful for a new day and new chances. I am grateful for healthy kids, a kind, hard-working husband, a family who loves me and friends who never give up on me. I am grateful for my freedoms and my opportunities and my choices, my education and my comfort. I am grateful for clothes to wear, food to eat, a vehicle to transport my family where we need to go. I am grateful to be able to worship how I choose, and to live in a place of peace and safety. I am grateful for the opportunity to repent and change. I am grateful for the enabling power of the Savior and my knowledge of Him and for His love. How can I tell my Heavenly Father that I am not grateful for all that I have and that I want more, and that I am not willing to be patient and submissive? Admittedly there are times when we will, more than likely, need to borrow money. These times include a home, possibly a car, and maybe education (although be very, very cautious when considering student loans!). But gratitude for our blessings will help us remember where all that we have comes from. 1-Start a gratitude journal. Every day list at least three things you are grateful for. 2-Make a list of all of your debts, lowest balance to highest, their interest rates and the monthly payments on these debts. Have any of you read the book, “The Entitlement Trap?” In this book, Linda and Richard Eyre discuss a system they implem ented in their family in order to help their children learn about responsibility and financial management. I have been wanting to try the system out at our house, but my kids have been too young. However, I think it may be a good time to start very soon…. Have any of you tried this system? Has it been helpful? Let me know, in the comments! Have you ever been lost? Have you ever used a map or GPS to get somewhere? Do you feel lost when it comes to money? To get where you want to go, you first have to know where you are! I like to think of personal finance like a road map. You have a destination in mind (if you don’t that should be your first step! More on that in a future post….). Once you know where you want to go, you need to figure out where you are. It’s kind of like when you walk into a mall and want to find the store you need to go to. You find the store you want on the map, then determine where you are, so you know how to get there. The first step to know where you are, is to determine your net worth. Financial Net Worth is one of the best ways to measure your financial health as well as track your progress. What is your net worth? Basically, it is your total assets minus your total liabilities. I like to track my net worth on a monthly basis, as we pay down our debt and add to our savings. It helps me to see progress made in our overall ‘big picture’. How often you track your net worth is a personal decision. Maybe a quarterly check is what helps you stay on track and see your progress. Perhaps an annual check is more appropriate. I do this exercise monthly just because it helps keep me motivated as I see my assets grow, my liabilities decrease and my net worth get higher! This is exciting stuff! How do I figure my net worth? FIRST, LIST ALL OF YOUR ASSETS. There are many opinions on what counts as an asset. Personally, I only use items that I could sell to bring in significant amounts of cash. For example, I count our minivan as an asset (although vehicles are rapidly depreciating assets! ), but I don’t count my couch or my desk in my office. One asset that you may choose to include an education fund. However, I don’t choose to count these as part of my assets. We have 529 plans set up for all of our children, and I do not include these as part of my personal assets, because I wouldn’t use them to cover a liability. And I sort of don’t ‘own’ these accounts anyway because the money in them is earmarked for my children’s education, not for my use. Make a list of all of your assets, and what they are worth. Add the amounts together and you have your total asset amount. NEXT, MAKE A LIST OF ANYTHING YOU OWE. medical debt, and so forth. Add all of these debts together, and you have your liability amount. YOUR LAST STEP IS TO SUBTRACT YOUR LIABILITIES FROM YOUR ASSETS. Do you have enough assets to cover liabilities? Calculating your net worth can be exciting as you see that you are ‘worth’ more than you might have guessed. Or it can be painful to see that you actually owe more than your assets. If your net worth is negative, do not despair. Use this new knowledge to develop goals to bring your net worth to a positive and ever growing number. As I mentioned, I like to check my net worth monthly, to see how much I can increase it each month. By eliminating debt (liabilities) and increasing savings (assets), little by little that net worth number starts to grow. Every time you make one of those debts smaller, or one of those assets larger your net worth will increase. So net worth is increased by saving and investing money, paying off debts and decreasing spending. Now can you see why calculating your net worth should be your first step in beginning your financial plan? If you don’t know where you are, you won’t be able to figure out how to get where you want to go. By understanding where you are, you will begin to see how important a spending plan is, how to analyze your purchases, increase income, decrease debt and liabilities, and where to place your priorities in order to get from “You are here” to your destination. This week, with your spouse if you can, list all of your assets, and all of your liabilities and determine your net worth! And, if you like what you have learned, subscribe to make sure you receive the latest posts and information to help you become financially confident and informed. When seeking for tips and suggestions about starting this blog, I consulted with one of my mentors who also works to educate women in financial matters. She let me know that the idea was a good one and the knowledge was valuable, but then said something that surprised me. She said, in essence, that the biggest problem she runs into is that women don’t know that they should care. I am the kind of person that likes to know the ‘Why’s behind the rules. If you explain to me why, then I am much more likely to follow the rules, or to want seek further understanding. I’ve noticed my children are similar. If I tell them they have to eat their vegetables I am met with resistance and whining. If I take the time to explain why we eat vegetables, what is in the vegetables that is so great (we usually look up whatever we are eating and find out what amazing things those particular vegetables will help our bodies do), then they are more inclined to eat them. They might not be excited, or think the vegetables taste any better, but because they understand how it will help their bodies, they are usually more compliant with eating their nutritious and carefully, lovingly prepared vegetables (or their pre-cut, raw carrots or broccoli out of the bag, is more like it). Temporal: Money, and all that we have for that matter, is not ours, but our Heavenly Father’s. We are stewards over what He has given us, and we are here to prove if we will be wise stewards over our resources. Individual: We are all sent to this earth with talents to share and sacred missions to perform. Many of our missions will require material resources. Our resources can be consecrated to help us fulfill our individual purpose and mission, if we are wise and faithful stewards over these resources. 83% want to get more involved in their finances within the next year. How do you gain confidence in a subject matter? LEARN more! Please join me on this journey to learn more about personal and family finance, in order to be better stewards over what our Heavenly Father has given us, and to bless the lives of our families and others, and to fulfill our personal missions.